Here's a guideline for the tuning kit and how each part of it works. For any further changes, there are several combinations available with the tuning kit. The clutch as packaged comes with #1 weights and .050 springs (uncolored/raw). #2 Weights=slightly more holding leverage than #1-might grab faster/may change engagement RPM-alters the "feel"
#3 Weights=more holding leverage than #1 and #2-good for higher HP/ engagement RPM changes-can still be used on lower HP motors to alter the "feel"
#4 Weights=most holding leverage of all-good for higher HP most severe conditions/ engagement RPM changes-can still be used on lower HP motors to alter "feel"
Something VERY important to remember here, all 4 weights actually weigh exactly the same. #4 weighs the same as #1. We did not alter the weights by changing overall mass, we changed the shape of the weight to get different effects. Changing the amount that the weight actually weighs would only change engagement RPM (and could greatly reduce holding power/leverage). We use different size springs to change RPM. So please, NEVER modify your weights! If you do not want to or can not assemble this set / part bij yourself, we will gladly do it for you. Please contact us without obligation. 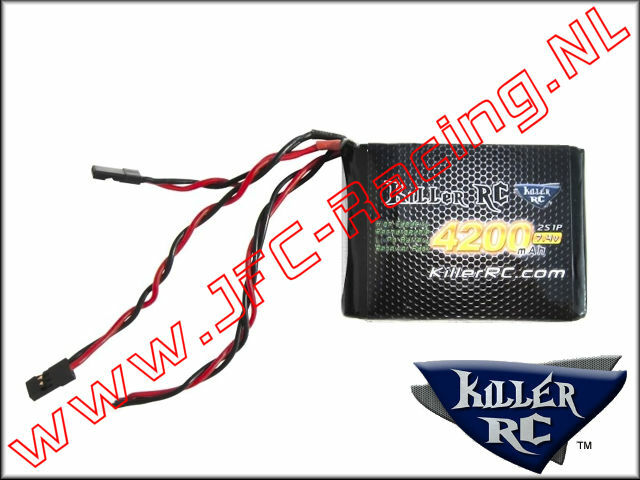 KIL 0296, RX LiPo Battery Killer RC (4200mAh)(7.4v)(Lipo)1pcs.